I'm in one of my favorite cities this weekend, San Francisco. For me personally this has more to do with my good friends and bbqing oysters while looking out at the pacific ocean, although the diverse culture, great restaurants and abundant varieties of cider have also influenced my opinion towards this great city. My early Friday afternoon flight out of Las Vegas was delayed and with my luck I ended up arriving right in the middle of Friday 5 o'clock traffic. 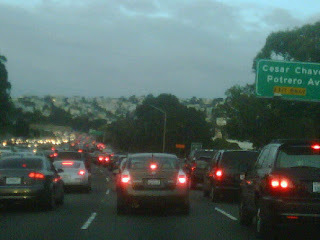 After picking up my rental car I immediately head north on the 101 towards the city. Less than 2 minutes pass and I am encompassed in bumper to bumper traffic. My estimated 15 minute google maps drive is now looking more like an hour. My Nissan Versa rental car is almost at a stand-still and I am quickly reminded I am no longer at home. Local drivers seem to be cutting in and out of traffic at every opportunity. Patience is definitely not a virtue to these drivers. I soon pull close to a 26' box truck, who appears to be using a technique I learned with the SMITH Driving System: 'Leave Yourself an Out'. This particular truck was trying to leave at least 1 and a half car lengths in front of him as his 'out'. Yet, as soon as the traffic crawled ahead, another inpatient driver in the exit-only right lane would identify this opportunity and fill the gap. There again the truck driver would hold off on immediately accelerating to ensure he had enough space between himself and the car in front to only be cut off once again. I watched as long as I had him in my sight and I personally identified 5 different occasions in approximately 3-4 minutes that this phenomenon occurred. I am sure we can all identify this example in our daily commute and although I can say this is a fairly common practice, it is a very dangerous one.With 4,321 fatal accidents involving large vehicles in 2006 (according to the FMCSA) it is a sobering reality that innocent lives are in our hands each time we drive. This particular driver was patiently trying everything he could to 'leave himself an out' yet he was still at risk due to the other drivers on the road. If you have never encountered the SMITH System of driving, I encourage you to take a look. (http://www.smith-system.com/) The five key points this system outlines can be applied to all vehicles and drivers although it is specifically focused towards large commercial vehicles. One tip I will pass on from my Smith System instructor is to treat the cars around you as if your mom/sister/daughter were in those drivers seats. We would all make different driving decisions if they were in the lane next to us. This blog goes out to the patient man driving the 'Flower Delivery' straight truck on the CA 101 N on Friday. If only we were all as patient as you.